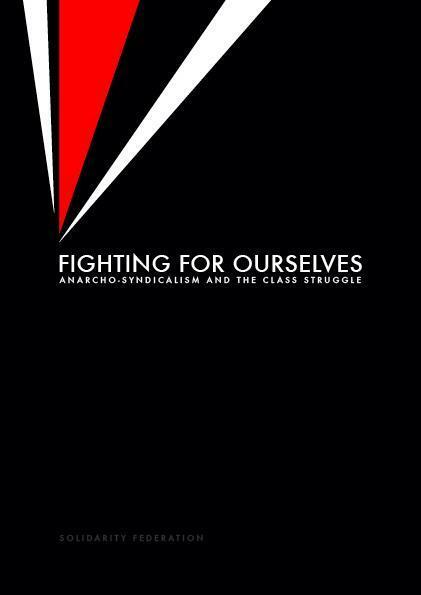 Collective Action's review of Solidarity Federation's recently published book 'Fighting for Ourselves: Anarcho-syndicalism and the class struggle'. Fighting For Ourselves: Anarcho-Syndicalism and the Class Struggle (from this point on referred to as FFO) is an important contribution to existing introductory anarchist works and an essential read for those aiming to familiarise themselves with both historical and contemporary anarcho-syndicalist thought and practice. The book stands as a testament to the seriousness with which the authors treat their ideas and it is to their credit that the text is available both so cheaply as well as orientated towards all levels of readership1. The book far outstrips, also quite dated now, comparable works, for example, Rocker’s classic Anarcho-Syndicalism: theory and practice which crucially due to its date of publication is unable to draw lessons from anarcho-syndicalism’s seminal episode – the CNT during the Spanish civil war. FFO, however, as a work of anarchist theory falls short of expectations and misses a number of opportunities to answer more robustly the challenges facing revolutionary organisations in the 21st century as well as longstanding criticisms of the authors’ own tradition. The book does succeed in its aims to “recover” a unique, international history of class struggle. Sections concerning the syndicalist, councilist and anarcho-syndicalist traditions of France, US, UK, Spain, Germany and Argentina are lively and engaging. These form a solid introduction to common ideas, methods and lessons that are otherwise scattered or misrepresented in more conventional texts. Part of this history includes the events of France, May 1968 and Italy 1969 which is refreshingly not filtered via the narratives of any particular ideology as is so often the case with these heavily contested episodes (this presents certain issues as well to be discussed further below). Here the authors take the more constructive approach of outlining key events from the perspective of the participants who made them so important – the wildcat actions of autonomous workers - as well as emphasising the critical role of the trade unions played in de-mobilising this section of the movement. Many of the studies are brought up to the present period and in respect to this it would also have been useful to have seen a bit more reflection on the existing IWW (Industrial Workers of the World), particularly in respect to its place as the other contemporary syndicalist tendency operating within the British labour movement. It is possible to infer a certain standpoint from the authors’ criticism of “apolitical” or neutral syndicalism but this is not made explicit through these passages. The revisiting of the writings of Pouget is also particularly insightful and a valuable opportunity to encounter what is an often neglected figure of this tradition within the English-speaking world. The history of the Labour party builds on the already sound analysis of “Labouring in Vain” (published by the Manchester-based libertarian communist journal Subversion) complimented by a critical account of the development of the welfare state, which as Adam Ford notes in his review for the Commune2, has the strength of emphasising the consensus across political party lines within the post-war government for reform. The way that social reforms have been used to de-mobilise and effectively curb the aspirations of working class movements in the UK is a critical point and should be made more often. In fact the key elements of the social democratic consensus are covered well throughout the book. A little more consideration could have been given to how “spatial fixes” for worker militancy extended into alternative management regimes outside of capitalism’s economic centres and the way these are instrumentally used to stabilise global economic accumulation3. Irrespective of this, the case of the partial, transitory and temporal nature of the Keynesian/social democratic project – spanning 25 years in only a small part of the world - is well made. Equally well-crafted is the “myth-busting” approach to the neoliberal counter-revolution, particularly in debunking the notion that neoliberalism is necessarily anti-union. As the authors note the object of neoliberal policy is to ensure workplace order and this can be achieved by a variety of means including successful co-option of the trade union movement. This is as well as outlining the strategic fashion in which this new political and economic consensus was formed and drawing the important conclusion that, “neoliberalism constitutes class collaboration on an individual basis”; a conclusion which opens up a number of opportunities for further analysis in light of the conditions of the ongoing crisis and the disappearance, as the authors also note, of the economic basis of this individualised class collaboration (in the form of accessible home ownership and the extension of easy credit4). Our criticisms of the book relate, in many ways to the particular peculiarities of the Anglophone tradition of anarchism. While many of the more valuable sections of the book build from a carefully considered, often quite innovative socioeconomic analysis, the sections concerning theory are generally representative of a certain superficial attitude towards the tradition itself (with the exception, perhaps, of the treatment of Pouget). The strategic conclusions that are drawn by the authors in the concluding chapter and the kind of challenges and lessons outlined prior to this are not drawn together in a way that makes these strategic choices speak to the most important aspects of the analysis. Overall the book gives the impression of anarcho-syndicalism as an almost contingent theory of struggle – based on continuing experiments in workers’ self-organisation not the conscious theorisation of militants – rather than a theory and practice ready to meet the challenges of the 21st century. Important changes within the tradition itself – such as the authors’ endorsement of “minority unionism” – are often discussed unsatisfactorily and leave a number of traditional criticisms of anarcho-syndicalism partially or inadequately addressed. We also have to take issue with the way that certain ideas outside of the anarcho-syndicalist tradition are represented throughout the book, particularly anarchist communism but also workerism and (the non-representation of) autonomism and the situationists. These are accounts often supported by distortions of the source texts or exaggerations of certain unfavourable aspects of their history. This is as well as questioning the particular way that the histories of some movements are treated, most notably that of the Federación Obrera Regional Argentina (FORA) – the Argentine Regional Workers’ Federation. Overall we have to criticise the authors’ choice of methodology in terms of how they treat their recovered history. The authors’ view of anarcho-syndicalism as “trial and error around a political economic core” may be true in a broad sense but doesn’t really do justice to the level of theorisation and strategies practised by members of these movements themselves. This treatment gives the impression, as is discussed in more particular detail below, of a series of cultural and historical factors that shaped the experiments of an international movement, often seemingly predestined to fail in light of the influence of these conditions. This is a method far more reminiscent of the historical determinism of Marxist history than of libertarian writings. Finally while the authors introduce an important theoretical tool in the identification of the “associational” and “representational” role of the trade unions we feel that this needs to be augmented by a fuller analysis of the role of unions within capitalism. This would at least be partially remedied by a more thorough discussion of the structures of capitalism and the state that also condition the sale and purchase of labour power, this is however unfortunately largely absent within the book. The authors make clear that, “both of these functions become closely intertwined in the course of the historical development of the trade union movement” (FFO, p.13). The associational and representational categories offer a good means to systematise our understanding of what communists find both desirable and problematic within existing workers’ organisations. Trade unions are, for example, for the most part spaces that bring together workers on the basis of a shared interest and, therefore, a possible means of also bringing about a political convergence on class issues5. However by focusing too strongly on this dynamic alone the authors risk simplifying the character of unions and, at worst, giving the impression of unions as a halfway house between revolution and reform. As Marx highlights in his analysis of the struggles over the working day (Capital, Vol. 1, chapter 10) the association of workers can follow as much the logic of capitalist competition as it does point to a world beyond it. A union, for example, is a pretty sound economic investment for workers on the basis of their need to preserve their sole commodity – labour power – from diminishing via the extreme rates of exploitation of capitalists. This is entirely consistent with the social logics which follow from the circuits of capital and doesn’t necessarily imply any communistic ideas or practices on the part of workers. The ability for workers to bring labour power to the market is essential to their continued survival. Association can present a means for ensuring this particular interest of workers is defended – their ability to continue to sell their labour power in the future, against, for example, unsafe working practices which will damage or shorten their working life – without ever necessarily challenging the class system that compels workers to sell their labour in the first place. These are the far deeper contradictions which communists have to tackle in respect to trade unions. While association may allow for a space for tendencies toward communism to flourish – usually as workers start to realise the internal limits of their demands within capitalism – its intermediate function is ultimately to facilitate the sale and purchase of labour power. It is true that both the associational and representational functions exist as contradictory forces within unions. Also that a union’s “associational” functions are those most closely associated with the pre-conditions of communist practice, i.e. free association, non-hierarchy, equality. It is also true that there is a constant tendency within capitalism for unions to adopt representational functions due to their compatibility with the needs of capitalist management. Nonetheless even associational means of negotiating within capitalism are still just that – the negotiation of terms within capitalism. In other words, even horizontal, ideologically anti-capitalist unions have to conform to the logic of capitalism and operate by the law of surplus value. It may be difficult, to use the example in the text, for the boss to negotiate with a stadium of workers but when pushed to extremes capitalism will do just that6. This is not, of course, to reject the day-to-day struggle of workers as hopelessly reformist or conservative. Rather it is to point to a particular set of contradictions that all communists have to navigate irrespective of the union’s form. As stated above the issue is about locating within these where the tendencies towards communist practice can develop. The point here is to suggest a wider analysis - in terms of the role of the essential function of trade unions within capitalism as means of negotiating the sale of labour power - that goes beyond the associational and representational functions. Such a perspective helps to clarify both what is at stake between these two organisational forms as well as the ultimate limitations of both as models of working class organisation within capitalism. In the absence of such an analysis, ‘association vs. representation’, and the case of political-economic organisation over political and economic organisation, risks taking the form of an ahistorical maxim presented as a catch-all answer to why all prior organisations have failed. This is also not aided by the inadequate way in which hierarchy, political authority and the state are treated throughout the book. There are a few largely unqualified references to the role of the state in text, for example, that “the state serves capitalism and cannot be served to serve the interests of the proletariat” and that winning the prize of political power means “getting to manage capitalism”. However the role of the state as, for example, the representative of the interests of collective capital or even the socioeconomic basis of political authority is inadequately qualified. Assertions such as “when you capture the state, the state also captures you” risk presenting a rhetorical objection to authority reminiscent of our tradition in immaturity as opposed to the more systematic, historical materialist analysis provided by Kropotkin, Bookchin and others. What results is a formalist conception of revolutionary practice that in spite of the richness of the social and economic analysis throughout the book (and even crucial insights relating to the influence of social and economic conditions on the shape of movements) ultimately boils down to the need for a single “correct” formula of revolutionary organisation. The theme of the political-economic organisation does go some way to addressing the issue of both the form and content of organisations. In other words, that organisation does not just require an associational structure but also needs to promote specific ideas. The missing issue, however, is how these should relate to changing levels of class consciousness. In other words how organisation forms a dynamic relationship to changing social and material conditions within the class. A fairly straightforward case is made in the closing chapter of the radicalising effect of struggle and that through this the workers will be brought closer to the politics of the anarcho-syndicalist union. This is, however, pretty unidirectional and there is not much consideration of what the function of the union should be should struggles ebb or subside. Other than that it should look to initiate new ones. Looking specifically at the nature of class consciousness gives clearer answers of why the contradictions which the authors identify – of the dominance of representation over association and the separation of the economic and political – continue to recur beyond the explanations given of the cultural, historical lineages and organisational errors associated with certain movements. The authors fail to answer in a comprehensive fashion why we witness the separation of economic and political functions, representation over association as recurrent phenomenon within working class organisations (Marxist, anarchist and reformist) over the past century. For example in the case of explaining the CNT’s participation in the republican government the authors put forward a convincing case of the critical importance of the strategic choices available to CNT activists on the eve of the revolution, the contradictory nature of Spanish anarcho-syndicalism and limitations imposed by geographical isolation and fear of foreign intervention. There are a number of further issues that could have also been taken up here7. Nevertheless a central purpose of this analysis is to counter the criticisms of Malatesta (discussed in greater detail below) that mass membership of unions will generally lead to a reformist slide of the politics of the union. Malatesta’s criticisms are rightfully identified as an important reference point for the distinction between anarchist communists and anarcho-syndicalists and recur in the commentary throughout the book. The authors correctly argue that it was actually the rank-and-file, mass membership that was, more often than not, the more radical force during the revolutionary period. This would appear to invalidate the criticism that formal openness necessarily brings about reformist unions. The political-economic and revolutionary character of the CNT is favourably compared to the purely economic nature of the, for example, reformist CGT. It is accurate to state that CNT militants at the rank-and-file played a leading role in the fight for collectivisations and against the politics of the Popular Front over this period. Yet their action would have been insignificant were it not for the fact that the ranks of the organisation were also swelled over this period by millions of radicalised peasants and workers. The most inspiring practices of the revolution, in short, arose as the result of the collaboration of revolutionary currents within the CNT and the constructive actions of thousands of peasants and workers. How then to unpick the puzzle of the critical influence of this largely new section of the membership? The answer is provided not just by looking to the programme and actions of the CNT but also close study of the growing composition and class consciousness of the Spanish working class. It was this which proved to be decisive in shaping the fate of the revolution in the period leading up to and during the revolution. It also provides a better account of why – with the working class faced with the de-mobilisation of the republic as well as the limits placed on collectivisations by the CNT itself – the civil war stopped having a social revolutionary character before the military defeat of the CNT. The revolutionary character of the CNT’s mass membership over this period was entirely contingent on the heightened state of consciousness of the working class. The CNT both extended and placed limits on the growing consciousness of the class over this time but it was the action and mentality of the workers which was decisive. The question, in sum, is not solely an issue of representation vs. association or the economic vs. the political-economic but how these functions form a dynamic relationship to the changing aspirations and consciousness of the class. It was the positive correlation of all three of these things which put the CNT in such a fortuitous position on the eve of the revolution, an important conclusion that can likewise be drawn in terms of the success of the Bolsheviks twenty years earlier. There are two issues in respect to the representation of the anarchist communist tradition within FFO. The first is in the portrayal of anarchist communist ideas as being infused with a “humanist” concern, and as a result the (erroneous) claim that, “the tradition put a varying emphasis on the class struggle as either a progressive or regressive force” (FFO, p.30). This informs how the ideas are represented throughout. The second is how Malatesta’s particular views on syndicalism are treated throughout the book. The primary source for the “humanist bent” of anarchist communism is a rather cursory remark made by the social historian Damier cited from his introduction to anarcho-syndicalism. While Damier has provided an invaluable and sweeping study of anarcho-syndicalism over the 20th century his knowledge of anarchist communism is comparably lacking and it is misplaced to draw such a strong view from a work that is not principally concerned with anarchist communism8. Identifying a humanist tendency within a much broader, history of libertarian socialist thought may be fair, if this was to include for example early utopians such as Morris. The tradition most clearly understood as anarchist communist however (also that which corresponds to the figures in the text) are those ideas developed from the experience of the First International. Here the characterisation of a “humanist bent” and a shifting position on class is entirely misplaced. The basic error of Monatte and of all revolutionary syndicalists, in my opinion, derives from an overly simplistic conception of the class struggle. It is a conception whereby the economic interests of all workers – of the working class – are held to be equal, whereby it is enough for workers to set about defending their own particular interests in order for the interests of the whole proletariat against the bosses to be defended. The reality is very different, in my view.The workers, like the bourgeoisie, like everyone, are subject to the law of universal competition that derives from the system of private property and that will only be extinguished together with that system. There are therefore no classes, in the proper sense of the term, because there are no class interests. There exists competition and struggle within the working “class”, just as there does among the bourgeoisie. It is possible to challenge Malatesta on the basis that perhaps he bends the stick too far here in terms of not acknowledging the possibility of a positive, sociological class identity within capitalism, but this would be entirely different from bringing the class basis of his analysis into dispute. For Kropotkin, revolutionary syndicalism represented a revival of the great movement of the Anti-authoritarian International which the Marxists were effectively trying to destroy at the congresses of the Second International by directing it into parliamentary channels just as they had done at the Congress of Basle in 1872 ... In his message to a meeting in London of delegates from British and French unions in 1901 he called for 'an International Federation of all Trade Unions all over the world' where workers would 'support each other irrespective of political opinions and nationality in the direct struggle of labour against capital’. During this period he also laid the groundwork for the principles of a “maximalist” revolutionary syndicalism, ideas very close to that which were later taken up by the FORA (Cahm, 1989: 241). Such a view also doesn’t really correspond to the legacy he left in terms of his writings. Reference to Kropotkin’s seminal work – Mutual Aid: A Factor of Evolution – come at the expense of sidelining the more rigorous, historical studies present in The State: Its Historic Role, The Conquest of Bread and Ethics among others. They also misunderstand the purpose of the work. Mutual Aid is often cited as a key reference point for a liberal, humanistic anarchism12. Kropotkin’s intention, however, was not to lay some naturalistic basis for anarchist ideas but to put forward an anarchist critique of the social Darwinism prevalent during his lifetime. Both its character, and common misreadings, are actually very close to those associated with Marx’s Capital. For while Marx’s intention to form an internal critique of the dominant ideas of bourgeois political economy spawned its own “worldview Marxism”13, replete with its own absolute laws, Kropotkin’s critique has spawned its own (admittedly far less pernicious) “ethical anarchism”. Ultimately it also does disservice to both the ideas and reputation of both Malatesta and Kropotkin to suggest they had such wavering views on issues that earned them both periods of imprisonment and exile. This is not to say that some of the particular characteristics identified by the authors of the early anarchist communist movement are altogether inaccurate. In its infancy the tradition did at times move at odds to the wider labour movement. Part of this related to the difficulties of developing means for influencing workers actions beyond those areas already monopolised by the statists and reformists. The avocation and practice of terrorism also, although more the responsibility of individual groups than those associated with the traditions of the International, had a further effect in isolating the movement. This was sometimes initiated in response to state suppression but not exclusively so. Even then this was generally not at the expense of focus on more communal and collective forms of agitation. Nonetheless the lessons to be drawn from the turn to insurrectionalism are important and are sadly lacking in the authors’ account which erroneously attributes the failure to gather mass support from a disinterest in organised labour. It would be more accurate to say that where disagreements concerning the unions did occur it was more in relation to whether syndicalism was a sufficient organisational force or in need of something more. Whether syndicalism was simply a means or a means to an end; this was and still is a central point of differentiation with respect to the anarchist communist and anarcho-syndicalist tradition. This was also a central issue upon which the debate between Malatesta and Monatte hinged. The authors correctly attribute the importance to Malatesta’s views here and they recur throughout the analysis in the book. The examples of the organisational evolution of the FAUD and the CNT (covered above) are also cited as counter-examples to his thesis that open, mass unions will tend towards reformism. Both these are not quite fair to Malatesta’s original case as, particularly in the instance of the FAUD, these unions took on a radically different function quite distinct from the particular examples that his views were related to. For example in the case of the FAUD the authors cite that its continuing success related more in its ability to act as a minority force catalysing other struggles than as a formally open union per se. Irrespective of this the authors’ commentary gives the perception that these criticisms relate to some desire to maintain “anarchist purity”14. This is not exactly representative of – what we would characterise as - the “organisational dualist” or specifist position Malatesta expounded. Malatesta’s views were far closer in spirit to that of Bakunin’s ‘International Brotherhood’ and the Intimité Internationale – a proposed and later, real clandestine network of dedicated revolutionaries, the latter of which ending up exercising considerable ideological influence on the Anti-Authoritarian International (Black International). Whatever one should think of the necessity of the clandestine basis of such an organisation, its purpose was not to exercise or enforce an “anarchist purity” but to draw together the best lessons and practices of the tradition amongst revolutionaries. This was not an exercise in ideological doctrine but conceived as a tool for intervention within ongoing struggles15. This acknowledged the necessity of propagating a libertarian communist programme while also understanding that setting the conditions of membership of the workers’ organisations as ideologically anarchist was also to drastically limit their appeal. The specifist organisation was an attempt to introduce those workers radicalised by struggle in the intermediate organisations (unions and fraternal societies) to the ideas of anarchist communism. This was in contrast to the views of Monatte, who viewed syndicalism as sufficiently anarchist in itself, and the anarcho-syndicalists, who argued that the intermediate organisations themselves should be infused with an anarchist programme. Italian Marxist currents of the 1960s (commonly collectively referred to as workerism or Operaismo) are subject to a similarly poor representation in the book. The authors’ account, as stated above, of the events of Italy 1968 themselves is reasonably comprehensive. This has the novelty of also drawing in both the internal (in terms of the influence of reformism and limited scope of tactics) and external (in terms of the actual gains available within capitalism over this period) limits that came to shape the form of the labour movement over this period. Hence we get a clearer sense why in Britain – where there was a traditional dominance of partnership trade unionism and radicals operated a “dual-card” or “boring from within” strategy – this period of heightened militancy culminated in the “Winter of Discontent” whereas in Italy and France workers practised more imaginative actions. There is fair discussion of the restricted scope of workerist ideas within the continued legacy of Leninist ideology. The treatment considering the current’s decline, however, is unfair and the passage quoted from Wright (FFO, p.82-3), in particular, stresses the re-emerging influence of the trade unions as much as an ideological turn towards the armed struggle in terms of attributing cause to the decline in workplace influence16. Citing Wright to support a broader claim of workerism’s link to the rise of the urban guerrilla groups is completely unrepresentative of the research presented his book. It simplifies the more complex picture that he presents of a diversity of groups, individuals and tactics and the context of the turn to the armed struggle in terms of an increasingly violent campaign of repression pursued against workers by the Italian state as well as the expectation of a fascist coup (Wright, 2002: 150). It also fails to acknowledge the often suspicious relationship between Potere Operaio and the first generation of Brigatte Rosse, that the workerist endorsement of “militarisation” was almost entirely ideological in nature and even then carried with it strong criticisms of the “subjectivism” practised by the urban guerrillas (Wright, 2002: 151)17. Likewise that it was the ability of the state to exploit just such confusion between the practices of the urban guerrilla groups and the workerist’s endorsement of “mass armed struggle” which allowed key figures such as Negri to be charged and publicly vilified as “mastermind” of the Aldo Moro kidnapping in spite of the fact that, according to the testimony of a Brigatte Rosse leader, “he had nothing to do with the Red Brigades”18. Such a simplistic account of the decline of workerism similarly pays no acknowledgement to the evolution of these ideas into the mid-1970s and the birth of autonomism and the “area of autonomy”. This misses the important lessons drawn from the translation of direct action in the workplace into the community in the practice, for example, of “self-reduction” (the collective refusal to pay heightened utility or transport bills) – a movement which was able to mobilise 180,000 families in the Piedmont region of northern Italy and enjoyed practical support from the Comitati Autonomi Operai (Workers’ Autonomous Committees) at the state-controlled electricity commission who were able to restore power to those disconnected for defying rate rises (Wright, 2002: 158). Out of the “area of autonomy” also came a growing network of “free radios” which formed a counter-propaganda network to the growing mass media of the corporations and state. These movements are important to consider because they suggest the opening up of new areas of resistance within the reconfigurations of advanced capitalism as well as pointing to areas of mobilisation beyond the more limited scope of the shop floor. It likewise reflects poorly on the authors’ conclusion that the legacy of this period was mostly the “politicisation” (recuperation) of militants. This failure to exploit the excellent opportunity that the history of this movement gives to re-assess and expand the framework that the workerists provide – particularly in respect to what it could tell us how syndicalist methods could relate to the community – is only worsened by all but cursory references, e.g. taking “control of the streets” (FFO, p.107), to community organisation throughout the book. Such a focus not only reproduces ableist and patriarchal blind-spots, in neglecting those terrains of struggle that do not occur primarily on the shop floor19, but also lends itself to a familiar criticism of anarcho-syndicalism as an ultimately narrower vision of social anarchism unwilling to acknowledge the debt that it owes to its own “communal dimension” (see Bookchin, 1993). were really that far beyond what anarchists, workerists, situationists (another ignored current in the book) and other revolutionary elements were both advocating and doing at the time. Ultimately we are given no indication of how a revolutionary union would have fared better – in spite of the fact that it couldn’t have existed - in these circumstances under the same conditions. There is a continued repetition of such fatalistic judgments. The survey of anarcho-syndicalist movements that occurs through chapter 3, for example, gives the impression of both a diverse as well as reasonably consistent (in terms of general operating principles) international tradition. What is especially absent, however, is a consistent commentary on what particular lessons can be drawn from the specific choices that militants made within the context of these movements. Militants, after all, were concerned with questions of ideology, strategy, composition and structure as much as at the movement’s inception as in its decline (as, amongst other things, the debate between Malatesta and Monatte demonstrates). Instead of representing these choices, however, the authors present an almost contingent vision of their own tradition, predominantly shaped by particular national cultures of labour organisation – “a practice of trial and error around a political economic core” (FFO, p.71). The failures of the French CGT or the CNT appear pre-figured in the legacies of their domestic labour traditions. The FORA, in particular, as the apparent synthesis of both syndicalist and specifist approaches appears to be an immensely important case study for contemporary organisation. This unique model of the “anarchist organisation of workers” is, however, discussed only briefly and only then in term of its apparent success. There is no source cited for the claim of a membership of 100,000 but it is likely that the authors may have confused this with the (reformist split) FORA IX. The (anarchist communist) FORA V claimed a membership of only 10,000 at its peak (Thompson, 1990: 173-4); an issue which itself is complicated by the unreliable figures concerning membership of both sections as well as the context of intensive strike activity within Argentine society20. This is followed by analysis of Arango’s (a prominent FORA theorist) rejection of society as not led by “inexorable economic laws” but “ideas and ethical concepts” which is subsequently attributed as the cause of the growth of “anti-industrialism” within the union and the 1915 split (FFO, p.52). This is a quite convoluted claim giving that at the heart of the 1915 split was the effective renunciation of anarchist communism and the move to neutral syndicalism. It is also problematic in the context of our broader tradition which has always rejected economic determinism (most commonly associated with Marxism) in favour of a view of history that emphasises the influence of both ideas and subjectivity while still having class analysis at its base (see Van Der Walt and Schmidt, 2009: 83- 114). The fatalistic conclusions drawn by the authors are at least partially rectified by their discussion of the contemporary context of partnership with the trade unions and the response, by sections of the IWA, to the practice of “minority unionism”. This, however, does raise a number of further issues. Although the authors are keen to stress anarcho-syndicalism is still able to “seek or achieve mass appeal” (FFO, p.70) their case relating to the specific conditions that gave rise to mass syndicalist unions is pretty comprehensively made and ultimately leads back to the perseverance of those factors which determined the tradition’s decline. Minority unionism also appears (the authors may disagree) to be a quite radical reformulation of the traditional strategies and tactics of anarcho-syndicalism. Pouget’s original vision of an “active minority” (FFO, p. 50) and the experience of the FAUD and the French CGT may suggest the acceptance of a minority role as an operating reality (although not really an aspiration). Nonetheless the tactic of calling open, cross-organisational assemblies appears to be a quite innovative and fluid strategy compared to, for example, the dual power role ascribed to the union, to draw on two prominent figures, by Pouget and Rocker. It would have been good to see more considered analysis of the contemporary conditions that contextualise this turn beyond the pragmatic ones given of declining trade union density and a divided labour movement (the latter of which is hardly a uniquely contemporary phenomenon). It would have likewise been good to have some reflection on how this presents an alternative strategy to anarcho-syndicalist unions that have attempted to retain their mass appeal – SAC, CNT-F and the Spanish CGT21. The extent to which this strategy does present a turn back to the model of free assemblies or soviets originally rejected by the CNT (FFO, p.59) is acknowledged - although the authors do point out that a “system of free councils” is also enshrined in the statutes of the IWA - but not really answered satisfactorily. The authors correctly point out that concern for the political weakness of structures has to be ultimately resolved beyond the particular characteristics of the organs themselves - in the consciousness of the workers and in the ability of revolutionary minorities to exercise a leadership of ideas22. These are, however, the limits of the observations and, ultimately, in the final chapter are re-articulated in terms of simply the need for a revolutionary union movement. The book rounds off with discussion of the nature of workplace organisation in the 21st century and a presentation of the Solidarity Federation’s vision for a revolutionary union movement. The authors emphasise key challenges associated with the neoliberal counter-revolution in Western Europe – de-industrialisation, service unionism, a continued collapse of independent working class space, dislocation of class identity and a de-politicisation of society in general (something that has both positive and negative connotations). There is an opportunity here to connect to a wider body of theory building on similar themes in terms of the communisation writers. This would, however, have possibly been superfluous to the text and generally the points are well made without the need to bring in deeper concepts such as subsumption. The authors make the case of the need for an independent and organised revolutionary union against spontaneist and anti-organisational theories of struggle as well as the rank-and-file, “boring from within” strategies pursued by the Left in respect to the TUC unions. They refute the case that revolutionary unions orientated towards open membership have to be reformist. This is fair on the basis of the arguments that are made – that revolutionary unions will attract class conscious workers – but doesn’t really address what is more central to the specifist criticism in terms of the ebbs and flows of struggle23. The state of the trade unions is analysed and their credentials as “mass organisations” is subject to criticism. There follows some practical/theoretical discussion on direct action and the revolutionary process as well as a review of the general operating principles and practices of revolutionary unionism, largely in contrast to statist and reformist ideas. The basis of “building the new world in the shell of the old”, the effectiveness of direct action and the need both organisation and solidarity is all outlined (what we would probably characterise as cultures and organisations of counter-power). These are, however, established largely independent, or at least not principally in response to, the challenges outlined in the previous chapter (those of the neo-liberal counterrevolution). There is some reference to the continuity of the same methods and terrains of struggle in spite of the fact that, “conditions in society may vary” (FFO, p.101). This is a fair point. There is also some discussion of casualisation and how this requires “different tactics and forms of struggle” (FFO, p.103). Although it is also argued that this is a phenomenon not specifically associated with neoliberalism. More pressing issues such as decomposition and collapse of class identity are not addressed. Overall the extent to which anarcho-syndicalism answers the particular challenges of the 21st century is not clear. This is especially so in terms of those continuing aspects of capitalist-state management that so effectively collapsed the anarcho-syndicalist traditions of the 20th century. While the book finishes with a worthwhile and thoughtful discussion of the nature of contemporary revolutionary transformation the case hasn’t really been made that anarcho-syndicalism is especially well placed to face the challenges associated with this task. FFO is a step forward in terms of the general absence of a sustained culture of historical reflection within the British anarchist milieu. While the authors do make some errors in their representations and we are forced to question their methodological choices, the fact that they have presented their tradition forward in this way – an exercise so often dismissed as “academic” or “navel-gazing” within the milieu – is certainly to their credit. FFO is also a marked improvement on the incredibly dated introductions that will still often form the basis of the inquisitive reader’s first impressions of our movement. Ultimately, however, the limitations of the book are reflected in the limitations of scope within many aspects of anarchist practice in the UK. It’s time to move beyond this type of book. We are in dire need of an honest appraisal of our tradition that draws in not just the historical but theoretical lineage of our tradition. Anarchists forsake their theory at their peril. We believe it is time to start forming that methodology and applying it in practice. This is above all what anarchists need – a methodology for the 21st century that allows us to locate a meaningful political programme within our constructive work within the class. Only then will social anarchism appear once more as a natural complement to the struggles of the exploited and a beacon of hope in the face of the neoliberal onslaught. Studies, Vol. 1, Number 1. Cahm, C. (1989) Kropotkin and the Rise of Revolutionary Anarchism, 1872 – 1886. Cambridge University Press. Maurizio A. [ed.] (1907) The International Anarchist Congress, Amsterdam, 1907, translated by Nestor McNab. Black Cat Press (2009). Thompson, R. (1984) "The Limitations of Ideology in the Early Argentine Labour Movement: Anarchism in the Trade Unions, 1890-1920". Journal of Latin American Studies 16 (1): 81–99. Wright, S. (2002) Storming Heaven: Class Composition and struggle in Italian Autonomist Marxism. Pluto Press. 1. V. Damier’s (2009) Anarcho-Syndicalism in the 20th Century. Black Cat Press, for example, which is also referenced throughout, presents a more comprehensive study of the traditions in question but more academic focus and length may be off-putting to some readers. 3. The FARJ - Federação Anarquista do Rio de Janeiro – prefer to use the terminology of “centre-periphery” to express a critical relationship to the language of “development”, which express essentially imperialistic and colonial relations. The author’s continued uses of terms such as “developed state” are a little problematic in this respect. 8. For example, Schmidt and van der Walt’s (2009) Black Flame: the revolutionary class politics of anarchism and syndicalism. AK Press. 10. For a complete overview see: Cahm, C. (1989) Kropotkin and the rise of revolutionary anarchism, 1872 – 1886. Cambridge University Press. http://libcom.org/files/cahm-kropotkin_and_the_rise_of_revolutionary_anarchism_1872-1886.pdf Also Morris, B. (2003) Kropotkin: The Politics of Community. Humanity Books. And Zabalaza Anarchist Communist Front (2009) Tangled Threads of Revolution: Reflections on the FdCA's “Anarchist Communists: a Question of Class”. Zabalaza Books. 11. “It needs another element about which Malatesta spoke and Bakunin always practised.” Kropotkin, P. (1914) Letter to Bertoni, 2 March 1914. Internationaal Instituut voor Sociale Geschiedenis, Amsterdam. 12. Whether certain “anarchists” have mistakenly taken up these ideas is a slightly different issue. Bakunin, M. (1869) “The Program of the International Brotherhood.” In: Dolgoff, S. (1971) Bakunin on Anarchism. Black Rose Books. 16. A factor that the authors likewise identify as a critical blow against their own tradition. 18. See, for example, “Negri’s Interrogation” In: Lotringer, S. And Marazzi, C. (2007) Autonomia: Post-Political Politics. Intervention Series 1. Semiotext(e). As well as reference to historical commitments to anti-racism and women’s liberation but very little on the actual struggles themselves or how they intersect with the socio-economic analysis outlined, e.g. how neo-liberalism has changed the terms of social reproduction. 20. The FORA V experienced a short revival following the failed strikes of 1917 but was in general decline following the 1915 split. 21. The CGT having been reasonably successful at this with a membership of roughly 60,000 people and representing around 2 million workers through industrial committees. FFO, however, as a work of anarchist theory falls short of expectations and misses a number of opportunities to answer more robustly the challenges facing revolutionary organisations in the 21st century as well as longstanding criticisms of the authors’ own tradition. this is one of the more interesting and thoughtful critiques i've seen so far. more of my own thoughts on it later. There’s a lot to chew on and a lot I really liked in this review (among other things, every time you said “I wanted more!” that was a spot where I also wanted more.) For now though I’m just going to make points where I’m less convinced, and where I have some questions, for the sake of discussion. I also don’t get how the pamphlet is fatalistic compared to your own perspective. In your ‘specifism explained’ piece that you cite, you write that “struggles that exist within the material and ideological framework of capitalism (...) will be heavily determined by the ideology of capitalist society and situated principally within the logic of capitalism (...) [and] be structured by a wider cultural, economic and political framework that will both shape their character, as well as causing their level of combativity and consciousness to ebb and flow (...) Anarchists need to find a way of engaging with these struggles in a way that relates directly to the existing composition and level of consciousness present within the class.” I agree with all of that, but it seems to me that Fighting For Ourselves is no more ‘fatalistic’ than that, and I wonder if the stuff that struck you as ‘fatalism’ could instead be read as just an account for those ‘ebbs and flows’ which were/are out of the hands of anarchists. I agree with that, but workers can associate for other purposes. Workers associate. Sometimes they do so for the purposes of negotiating under capitalism and sometimes they do so for purposes of breaking out of/operating outside of negotiation with capitalism. Does this difference in purposes require two different grouping/associations or workers, or not? I don’t think your review made an argument on this point though it seems implied in your review that your answer is yes. I think the pamphlet says no, at least implicitly through the criticism of the separation of political and economic. I guess I don't get the whole question about "negotiations". Workers will always negotiate until they establish workers self-management and libertarian soc./comm. The CNT recently negotiated an interim settlement to a struggle, not the capitulation of capitalism in this instance. If the question comes down to "professional" and "institutional" bargaining by bureaucrats, yup, that's an issue. But left sounding rhetoric about negotiations in any form is, in my opinion, just rhetoric not based on the sad realities of daily life on the shop floor. I agree. To my mind then the issue is how to negotiate/compromise, not whether to do so. I think the idea of struggle without negotiation/compromise doesn't really make sense unless we're fairly far into a revolution. The workers directly effected should elect recallable delegates to negoitiate with management. Outside organisers or advisors should not take part in that process. I would also argue that communists in the workplace should not take part in any negotiations. I would also argue that communists in the workplace should not take part in any negotiations. Interesting point. Do you mind unpacking it a bit. Presumably so that we stay pure and keep smelling of roses? I'd say it's impossible for mandated delegates to negotiate. If they have the power to make deals, they are representative. If they are mandated delegates, the decisions need to be made collectively by affected workers in mass meetings, and the delegates don't have the power to negotiate actual deals. Okay, so first the legitimate comment, then the derail. Outside of the revolution, we need to have a way to bring demands forward to a boss. I agree that we do this with electable, recallable delegates. Now whether we call that negotiation to me seems to be a semantic issue. If it's clear that the delegates have no power and all decisions have to first be approved by the larger group, then I think that's fine. But it's very possible that if a group of delegates goes in to meet management they may discover new information that changes the demands (for better or worse). In this case, the larger workforce--acting through the delegates--could be put into a positions of adapting their demands and negotiating with management for different settlement. Now: Awesome Dude, dude, you're in the IWW! It's fine have a left-communist critique of negotiations and demands, but how do you square that with membership in an organisation which consciously seeks recognition in the workplace/agreements with the boss and has a system of regional organisers? It all depends on your relative strength and that of the boss. Sometimes we got 'em, sometimes they got us. Sometimes it just a draw and another day to come back to. And sometimes it comes down to finding a way to honorably retreat and cut early losses. The concept that we are all united get severely tested in struggle. Sometimes we stay united, sometimes not. I guess I'm not of the cookie-cutter school of thought. Not saying you are Nate, just a general comment. So a lot of what is written will get tested and the best and the worst will come out in the wash.
communists in the workplace should not take part in any negotiations. I'd rather talk about the pamphlet and the review, but, for what it's worth, I think there are no collective workplace struggles that don't involve some kind of negotiations unless we're in a revolutionary situation or the people involved are doing illegal actions that are an end in themselves (like organized theft for the purposes of getting the stuff stolen). Even if there's no delegation and every worker involved is present, the workers in a struggle, as a group, are still negotiating with management (short of revolution etc). But I'm open to having my mind changed. Let's hear some example of workplace struggle that don't involve negotiations. Ideally the workers should hand their demands to management, take wildcat industrial action until management give in to all their demands. No negoitiations, no delegates, no prospect of being soldout. Respectfully and sincerely asked: Have you ever done this? If so, I'd love to hear about how this all went down and what the results were. FULL COMMUNISM, or, defenestrate yourselves. I dont want to further derail the post, so ill start a new thread about communists and workplace negotiations during an industrial dispute. @Chilli. Though im still a subs paying member, im not actively oganising in the iww. Maybe we're using the term differently but as I see it that's still a form of negotiation under capitalism. The fact that management exists and can meet the demand means management gives something (the demand) and gets something (workers return to work). If the demand is so high that it's not worth it to management to meet it, they'll close up shop. If the demand is meet-able and the workers stay intractable, management eventually gives in and meets the demand because it's better than closing up shop. That's a negotiation. (That's different than, say, workers occupying a plant to take ownership and run it themselves - while I realize there's limits to that as well, that's not negotiation with management, at least not in the same sense anyway.) And it's likely that management will say "look, lower your demands and we'll meet them" and the workers will consider that - especially given that workers operate under constraints based on the fact that they're workers, ie, they need money and their main source of money is the job they're not getting wages from while on strike. Edit: Those constraints also shape what demands people pose in the first place. People in a workplace struggle don't tend to pose demands to bosses like "we want the full value produced by our labor" or whatever because that would involve putting the boss out of business. They tend to pose demands along the lines of "we want to change how much of the value we produce goes to you and how much goes to us," which still leaves capitalism intact. (Which is not to speak against demands, just saying that this fits with what the review said about negotiations under capitalism, over different versions of life under capitalism.) Those demands are formulated in part based on a calculation of what people think they can actually win, and how long and how hard they can fight against management given how much money they have, what else is going on in their lives, etc. Also, as an example... (Sorry to be vague, it's not my story and I dunno how public they want this currently.) A friend was involved as an outside supporter in an independent workers group, with workers who weren't legally allowed to organize. The group got pretty big and ran an action on a large facility that temporarily shut it down in the way you describe - making demands, shutting down the facility. It was a large transport facility so the shutdown cost millions of dollars. Management responded quickly by caving in. They got every single demand met, though they still lost some money during the time they were striking. It seems to me, that's a negotiation, like I said. When management in meeting their demands said "hey, next time this kind of problem comes up, just come talk to us, we'll work it out, no need for all this bother." This was a group of workers largely driven by short term concerns - wanting better lives under capitalism - and not radicals. For a group of workers like that, during the time period when management is still afraid of that economic leverage, there's no real reason not to negotiate because negotiating saves time, money, and hassle for all involved. No reason other than ideological reasons, and in this case the outside organizers and supporters were the ones pushing those ideological reasons, emphasizing direct action etc. And like I said I think this was still a kind of negotiations because the workers posed a demand and created consequences until management met the demand. Management figured meeting the demand was the most cost effective etc response, so that's what they did. For a critical review of the pamphlet "Fighting for Ourselves Anarcho-Syndicalism & Class Struggle"